The Hoysala empire ruled between the 10th and the 14th centuries. The capital of the Hoysalas was initially located at Belur but was later moved to Halebidu. Art, architecture, Kannada& Sanskrit literature and Vaishnavism flourished during their reign. .. .. .. we are interested in Mandya ~ more specifically Melukote Thirunarayanapuram for the temple here and because of our Acaryar staying here. Our Acaryas following the holy orders of Sri Udayavar believe that one must reside at Melukote (Thirunarayanapuram) at least for a day. The Temple ‘Sri Selva Narayana Perumal Kovil’ at Melkote referred to by us as Thiru Narayanapuram, is a Abhimana sthalam of Udayavar, who lived here for 12 years, codified and ordained strict procedures for betterment of Sri Vaishnavism. It is a hilly protected place, calmness, serenity and divinity pervading here. It is on rocky hills known as Yadugiri, Yadavagiri and Yadushailadweepa, overlooking the Cauvery valley. The moolavar here is Thiru Narayanar. The beautiful Uthsavar is ‘Sampathkumarar also known as Selvapillai’ – the name of temple is ‘Cheluva Narayana Swamy Temple’. 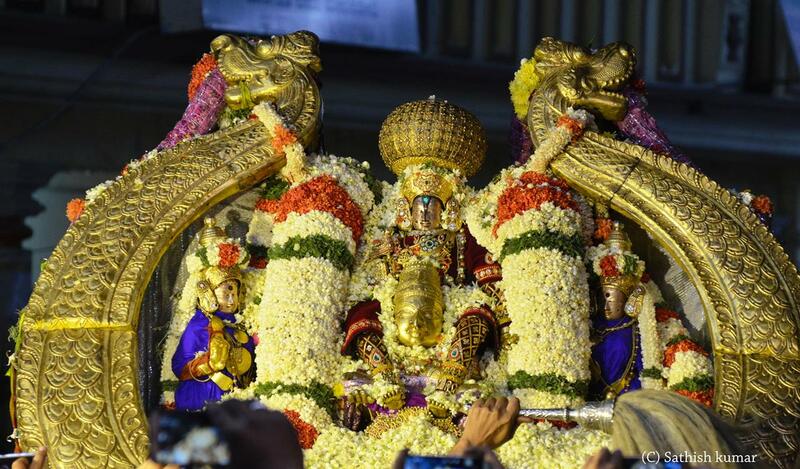 Sure you would have heard of the most famous Vaira Mudi Sevai – whence the Lord wears the throne made of Diamond. The annual Uthsavms are being celebrated with grandiose. The most capturing is the ‘Sri Vairamudi Kireetadharna Mahotsav ‘ part of the Brahmotsav. This famous crown makes it journey from the Mandya treasury every year. Devotees in lakhs throng Melkote to have darshan on the Special occasion ~ and today is that special day. In the nearby Thirumylai Sri Madhava Perumal Temple, this occasion is being celebrated for many decades now. The idol of Selva Pillai, here too has purappadu in a similar looking Garuda sevai as ‘Vairamudi sevai purappadu’.